Photos of the Weddell Sea, approaching the Antarctic Peninsula. “The Weddell Sea is, according to the testimony of all who have sailed through its berg-filled waters, the most treacherous and dismal region on earth.” — from The White Continent by Thomas R. Henry (1950). This morning finds us on the northern edge of the Weddell Sea, approaching the northern tip of the Antarctic Peninsula from the northeast. We had been told that these waters can be choked with ice. 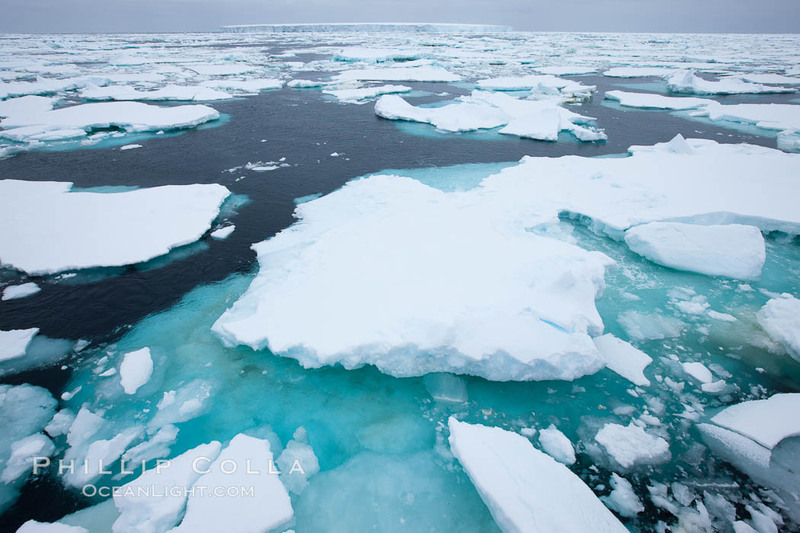 The ice originates in the Weddell Sea, where enormous ice shelves produce tabular icebergs which in turn break apart into vast spreads of ice pieces. I wake up about 5am and peek outside the window and see nothing but ice. Big chunks, small chunks, periodic chunks big enough to be called bergs, and a few huge distant tabular bergs. I have waited a long time to see a seascape like this, and the sight of this much ice is awesome. Pack ice, a combination of sea ice and pieces of icebergs, Weddell Sea. I go out on deck. It is quite cold. I walk up to the bow and take some fisheye photos, and shoot some video clips, including a time lapse of the boat pushing through the ice. (The resulting video is interesting but if watched too many times the novelty wears thin and the jitteriness becomes irritating.) We are moving somewhat more slowly than yesterday, but nevertheless the icebreaker M/V Polar Star is able to push aside or split the ice pieces easily, and it seems to me that we make good progress through the morning. Video made with Canon 5D Mark II and 15mm fisheye lens. However, we have a long way to go yet before reaching Paulet Island in the Weddell Sea, and the captain decides to speed our passage by avoiding the pack ice, changing course to take us through the Antarctic Sound to reach Paulet from the west (rather than the more direct approach through the Weddell Sea from the northeast). Eventually our course change takes us out of the pack ice and our speed increases. We continue to see occasional tabular bergs, along with a few whales including two orca. Albatross sightings are now on the wane, and we won’t see many more until the Drake Passage at the end of the trip.